These posts will center around instructional technology other than Cybergate. This may include ways to more effectively use the technology we have in place as well as think about new technologies to foster student learning. You probably are already aware that you have access to a powerful video conference tool from inside Canvas, titled Zoom. I’ve included a picture of the link. Zoom is very easy to use and intuitive, meaning that you should be able to use it with only a little trial and error. Below I’m going to discuss Why you might want to use Zoom, and How to set it up and use it. To record a presentation or tutorial. Zoom is perfect for recording a presentation or tutorial of some computer application. Whatever you can see on your desktop can be shown through Zoom and recorded and made available to students. This might be particularly useful for some of the trickier formulas or math related problems. To set up an optional (strictly voluntary) class meeting relative to a specific event, e.g. you could set up a Zoom to discuss political debates following the debates while everyone is still fresh. To bring in a guest lecturer to your class session. While you would still need to let the Dean know and get approval, this is a perfect way to bring someone into your class that you know can bring some specialized knowledge or a powerful story to connect with your students. This way your guest could be literally anywhere in the world and still present in your classroom. These are only a few ideas, but I’m sure you are getting the idea. 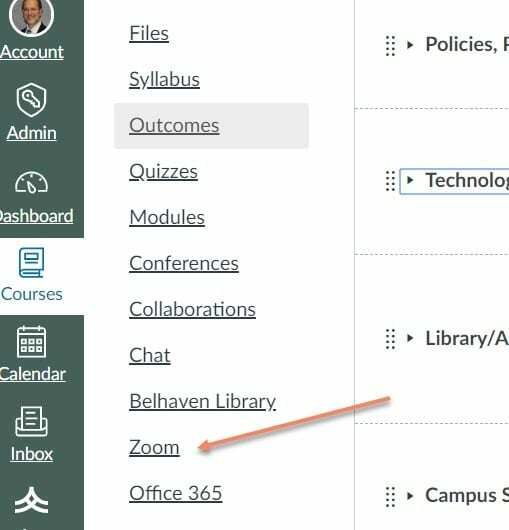 Starting a Zoom is very easy, all you will need is your Belhaven login and password. Once you click on the Zoom link you will want to “Host” a meeting after you enter your credentials. To invite others, either email them the link or post the link in an announcement on your course site. I’ve included a video below which walks you through the process. Poll Everywhere is a web-based tool which easily builds into powerpoint presentations to allow students to respond from their mobile devices. It presents the results in real time, allowing for evaluation of knowledge, or as a prompt for discussion. Here is a short video which demonstrates it’s use. I know you are always on the lookout for an activity to use after 9:00 that will actively engage students and make that last hour meaningful. Here is one activity that will do that. Kahoot. Kahoot is a classroom engagement software that is free to instructors and provides an interesting way to engage students in content. I’ve included some links to a couple of tutorials about how to use Kahoot below. It will involve you setting up the activity in advance but on the plus side, it can be used over and over again as you teach the class. This would make a great test-review session and could spark some interesting discussion as well. Don’t be put off that the tutorials are based on secondary education models – this will work just as well for adults in that last hour of class. I’ve been in a session when this was used and I can personally vouch for how effective it is. Please post a reply to this if you use it and let me know how it went. A webinar going over the most recent Canvas updates and answering questions was conducted on October 25th. Joe Villarreal, our resident Canvas expert and technician led the webinar and shared a LOT of great material that will definitely be useful to you. After 9:00 Activity – Kahoot! It will involve you setting up the activity in advance but on the plus side it can be used over and over again as you teach the class. This would make a great test-review session and could spark some interesting discussion as well. Don’t be put off that the tutorials are based on secondary education models – this will work just as well for adults in that last hour of class. I’ve been in a session when this was used and I can personally vouch for how effective it is. 5 Minute Guide to Kahoot! You can search for more tutorials on YouTube if needed. There are a lot of resources available for Instructors to draw from to improve their ability to achieve student learning both in and out of the classroom. At this LINK you will find an excellent resource from Indiana Wesleyan University Faculty Development Blog. This particular session deals with group work within the classroom and how to organize and manage group work effectively. In this series on “Setting the Table” from Indiana Wesleyan you will find other presentations which will hopefully inspire you to try something new and see your role in a fresh light.